have you tried loading the lastran sim? as for uploading the actual files i think sim files are a bit tricky to upload, (if you don't know) at the bottom of the text box when posting there's a plus with attachments and other options, click to open this menu and there will be an attach section, you can either click browse... for the file or click and drag the file to it. now here's the part that may get confusing, either sim files or setting files you have to put in either a file or zipped file to be able to attach it so it may be easier just to put all those types of sets/sims in a single file when posting them here. hope this helps. now there won't be a time limit on the post, just in case bots doesn't get back in time to check it out. i dont think that was suppose to happen..
Works fine on my side with just the settings file. Some vegys is what I see. However, there is an overflow error that I did not bother tracking down because I did a "run and forget" on my current experiment. A quick fix for it is to simply disable safemode, that is what I did. Disable safemode will activate automatic error ignore. If that does not help there is a good chance you have a corrupted file and need a fresh install. 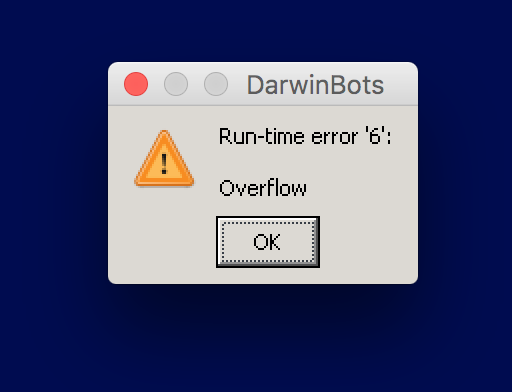 When I get back from my winter break there is a good chance I will be restarting my own evolution experiment and this time I will run it from vb to try to catch this overflow error. When this will actually take place depends on my results, might be the end of the month. I really want this thing to prove its worth, otherwise I wasted 3 months on an idea that did not really work. However, I will give you guys a full report with my current results so it does not feel like a complete waste of time. how do i disable safemode? Go to settings, click on "global settings" and uncheck "use safe mode"
It will be cool if you can recreate the error from vb6 since you are trying to port db2 into java. I generally will not attempt to port anything "by eye" even if I knew the language well. Installing vb6 will help you learn how db2 actually works. 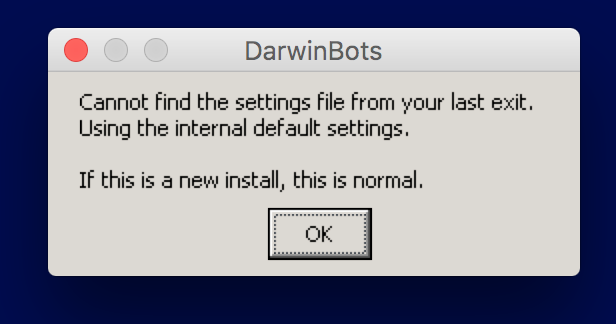 Problem is, it is a pain to install and find these days. yeah, i tried finding VB6 for running on wine, but nothing, hmm.. isnt there any error reports that DB2 generates? no autogenerated error log that could help you trace the error? There is a reason vb6 is pretty much dead. It has one of the most god awful debug schema on the planet. Other issues include lack of modern apis. But it is easier to learn then Java. I started writing vb6 17 years ago. dont you have any plans to officially port over DB to some other language like C++ or something? wait, didnt you already do that? i think i read something about a C++ port on DB? Yes, a while back Numsgil started a port to C++. I was not trilled about the idea at the time mainly because I was working on some reasonably advanced stuff and using vb to do it was easier than learning a new language. I think he got a good chunk of physics and DNA execution ported. Not really sure why he switched over to c# other then to attract new age devs. and start fresh. Something I kinda wanted to ask him actually. The thing with C++ is that it is not the best language to try new stuff in. I guess that was one of the reasons to use c#. Honestly, If I knew how much hard time I will be having debugging in vb6 I would have considered a port to something like Java a long time ago. I become aware of the concept of stack tracing about 3 years ago studying for a MCPD exam. I think C++ also has better debugging than vb6 but will need to wait for Numsgil to confirm. Really, the way I expected everything to go was Numsgil finishing his port to c++ and then me sticking my features in and be done with it. But, I found out on more than one occasion life never turns out the way one expects it to turn out. I digress, I expected to be making real video games for a big time company by now, but in reality all I have is a technical institute certificate that may or may not help me skip some introduction to programming classes in a Uni. but yeah, what options for debugging are there in VB6? i mean, i would thought that even a slightly older language would have had some sort of error tracking? is there no way to catch errors and where they occured? The error tracking is good and user friendly and all but it only works if you run the project from vb6. 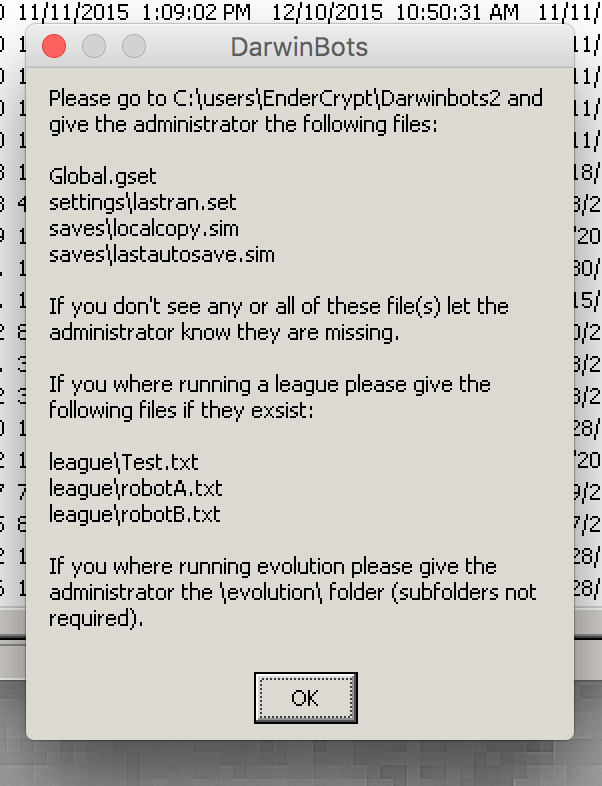 Once you compile and distribute the exe all bets are off. Especially with something like db2 where something may go wrong after running it for a very long time and enough possible things that can go wrong it really becomes like rocket science. Once you transfer from a simulation into a real life you really hope it will not end up like the space shuttle program. ... Something funky is going on there that has nothing to do with how the start new button works. Maybe you have an im.gset file in the db folder, just guessing. Did you try a clean install and then loading your lastran,set file like I just did from vb6?